Susan Hooper Friday Lamb, 58, died peacefully at her home on December 3, 2017, after an extended illness. Born June 15, 1959, in Gastonia, North Carolina, and raised in nearby Lincolnton, she graduated from Lincolnton High School. Susan earned a degree in English from Lenoir-Rhyne College in 1981, where she was a member of Zeta Tau Alpha and president of the Panhellenic Council. Following graduation, she worked in Chapel Hill. In 1983, she married Terrell "Terry" Hadley Lamb, a Graham, North Carolina native. Early in her career, Susan worked in Raleigh as a paralegal after completing the Meredith College paralegal program. She also wrote and edited for The Ensign magazine and for Meredith College before the birth of her two daughters. 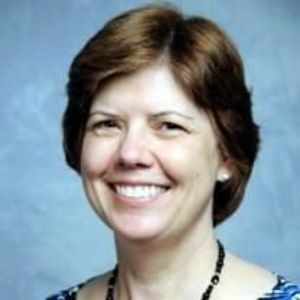 In 1998, Susan began a nearly 20-year career as the public information officer of the North Carolina Museum of History. In 2017, she received the Raleigh Public Relations Society's Watt Huntley Award for Lifetime Achievement in public relations. She was also awarded The Order of the Long Leaf Pine. A long-time member at West Raleigh Presbyterian Church, Susan served as a deacon, arranged meals for homebound members, and served on the board of the Children's Center. She also served with the prayer shawl ministry, taught children's worship, and played handbells. She was accomplished in many forms of needlework and was a gifted pianist. She generously shared her talents with others. Her strong faith in God guided her throughout her life. Susan dearly loved her family, friends, colleagues, and chocolate. Her family is grateful for the support and comfort from many people during her illness. She is survived by her mother, Lila Ponder Friday; husband, Terry; sister, Sarah Friday Peters (Alexander); all of Raleigh, and her daughters Elizabeth Lamb Poindexter (Matthew) of Hillsborough; and Emily Allison Lamb (fianc� Matthew Viva) of Durham. She is also survived by a granddaughter, Cora Watts Poindexter, and several nieces, nephews, and cousins. She was preceded in death by her father, The Honorable John Ralph Friday. Visitation will be held from 6:00 until 8:00 p.m. on Wednesday, December 6, at Brown-Wynne Funeral Home at 300 St. Mary's Street in Raleigh, followed by a private burial on Thursday. A memorial service will be held at West Raleigh Presbyterian Church on Saturday, December 9, at 2:00 p.m. In lieu of flowers, memorial contributions in Susan's name may be made to West Raleigh Presbyterian Church, 27 Horne Street, Raleigh, NC, 27607.